(Greenville, SC) The Greenville Chamber presented Quality Business Solutions (QBS) with its May 2017 Small Business of the Month Award. President/CEO Pamela Evette and team accepted the award at the Chamber’s monthly board of directors meeting on Thursday, May 18, 2017. A 100-percent woman-owned business founded in 2000, Quality Business Solutions, Inc. (QBS) offers a wide and comprehensive range of integrated PEO/ASO services, including payroll administration, unemployment management, insurance, benefit administration, human resources, workers’ compensation and tax reporting that can be tailored to meet each company’s individual needs. Based in Travelers Rest, QBS is focused on innovative solutions to provide cost-effective outsourced solution for non-core business functions to its clients. From insight to implementation, QBS is focused on taking the burden of administrative and back-office work away from its clients, allowing them to focus on what’s most important to their business and creating long-term, cost-conscious and turnkey solutions that improve productivity, minimize risk and drive value. QBS joined the Greenville Chamber in 2007. Since then, their team members have participated in many Chamber programs, including Greenville Women at Work, Annual Meetings, Leadership Summit, Friday Forums and Pulse Young Professionals. Pamela Evette was honored with the ATHENA Leadership Award at the 2017 Annual Meeting earlier this year. For more information, visit www.qualitybsolutions.net. The award was presented by Traci Newkirk of Intellectual Capitol, representing the award selection committee. The award is sponsored by Cowart Awards. About the Greenville Chamber’s Small Business of the Month Award The Greenville Chamber recognizes an extraordinary small business at each monthly board meeting. The Small Business of the Month is chosen by a selection committee made up of past Small Business of the Month Award winners. The Chamber’s annual small business of the year is selected from the year’s small businesses of the month. 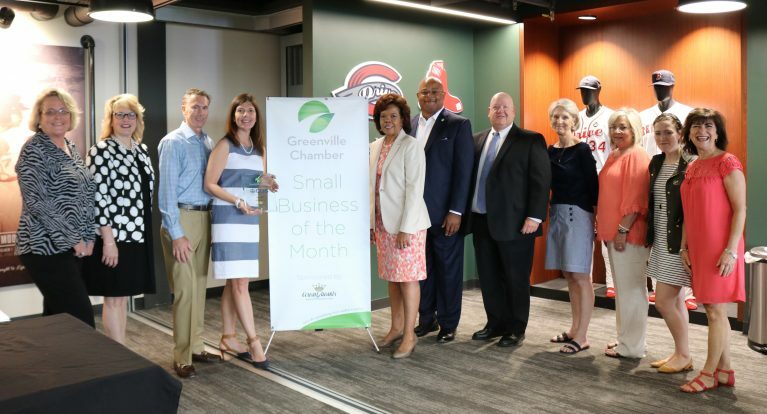 Learn more and nominate deserving businesses at http://greenvillechamber.org/businessgrowth/small-business-of-the-month/. The Greenville Chamber, now in its 129th year of operation, is the largest business organization in Upstate South Carolina with over 2100 Investors supporting the vision of a globally competitive Upstate economy where businesses succeed and people prosper. For information, visit greenvillechamber.org.